A smartwatch with everything you want. 44mm case. 11.95mm thickness. 20mm band. 300mAh battery. Up to 1.5 days – 2 days of mixed use. Patented fast wireless charging technology. Recharge fully within 80 minutes. Ticwatch’s home made OS, with frequent, regular updates based on users’ suggestions. A full range of stock apps and easy-to-read notification management feature helps you stay on top of your busy day. 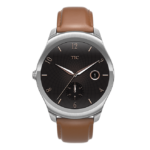 Rich watch face selection, and more to come with updates.